There is a great article on Ian Griffith's Sports Podiatry site about a new test for ankle stiffness called the Lunge Test. You can read the entire article on the lunge test for ankle stiffness on Ian Grffith's site, but here is a summary of the Lunge Test. 1. Stand against the wall with about 10 cm between your feet and the wall. 2. Move one foot back a foot's distance behind the other. 3. Bend the front knee until it touches the wall (keeping the heel on the ground). 4. If your knee cannot touch the wall without your heel coming off the ground, move foot closer to the wall then repeat. 5. If your knee can touch the wall without your heel coming off the ground. move foot further away from the wall then repeat. 6. Keep repeating step 5 until you can just touch your knee to the wall with your heel on the ground. 8. Change the front foot and test the other side. 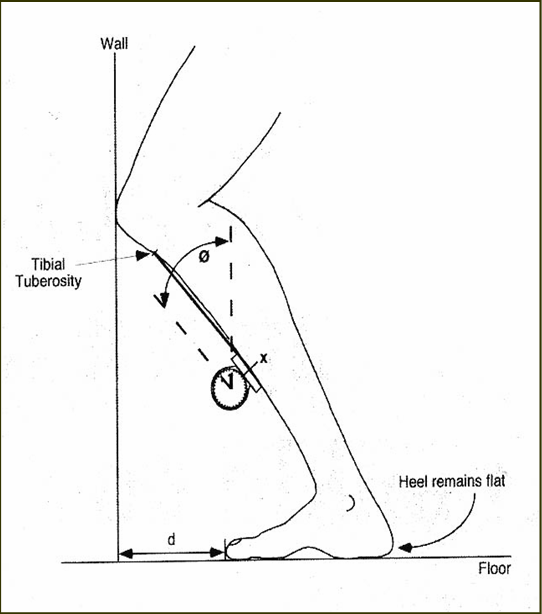 If your ankle falls in the restricted range this suggests that there is increased ankle joint dorisflexion stiffness. This may increase your risk for lower extremity injury. If you'd like to know how far your ankle should be from the wall relative to the length of your shin, please refer to this Ankle Flexibility chart. Please watch this video for a demonstration of an exercise that can help increase ankle joint dorisflexion. Check out these videos demonstrating ankle exercises, which unfortunately could not be embedded. Videos 67 and 68 are exercises designed to improve ankle mobility.